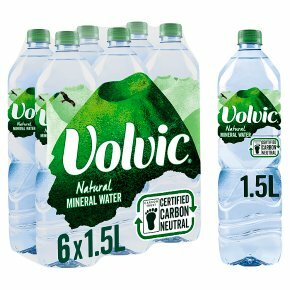 With its clear and refreshing taste, Volvic natural mineral water is filtered through 6 layers of volcanic rock giving it a unique mineral composition. 6 layers of volcanic filtration.Volvic Natural Mineral Water is unstoppable. It flows through six layers of volcanic rock, which infuse it with unique volcanic minerals, and gives it a clean, crisp taste that helps you feel your unstoppable best. This 1.5L multipack is perfect for enjoying at home with friends or family. Our Volvic bottles are all 100% recyclable, so please recycle them so they can be turned into something else.